In 2015-2016 GDP in USD decreased due to USD strength in global market, however annual growth of GDP in absolute terms is 104%. The steady growth of the population's quality of life indicates the dynamically emerging economics growing. 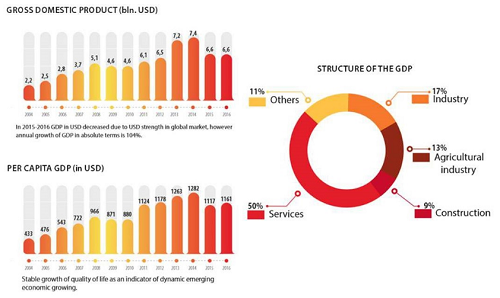 Services constitute the largest share of the GDP of the Kyrgyz Republic - 50%. Other sectors have a smaller share in the country's GDP. 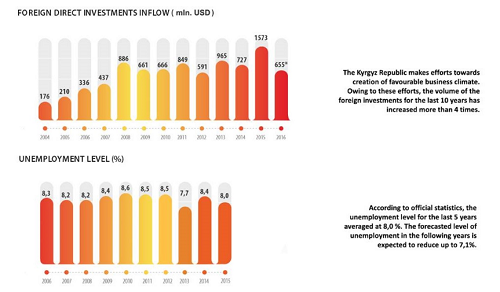 Kyrgyz Republic is making efforts to create a favorable business-climate in the country. Due to these efforts, the amount of foreign direct investment into the country has raised by more than 4 times. According to official estimates, an average unemployment rate over the past 5 years averaged at 8.0%. It is predicted that the overall unemployment rate will fall to 7,1%. To get more details on the economic indicators of the Kyrgyz Republic in the latest report Doing Business 2018, you can download the respective country profile below. The latest index on economic freedom in the Kyrgyz Republic in 2018 can be downloaded from the attachment below.